Throughout the course of Come Back to Me, Beau and Tess spent very little time together. We are introduced to their love for each other - which resulted in Tess conceiving a child, unbeknownst to Beau at the time he left for his photography assignment. However, despite their physical absence from each other, the strength of their bond and love for each other is obvious in their longing for each other despite the continents which separate them. Shot down in the midst of a war zone, Beau survives a helicopter crash, leaving him stranded with no means of communication with the outside world. Back home in America, Tess learns of the crash but refuses to believe Beau is gone unless she sees his body. As such, she lives in denial for much of the story. Soon after she, finally, gives in to pressure from family and friends, deciding to move on, she sees Beau in an approaching vehicle which shocks her, resulting in her having an accident of her own. The emotional portrayal of the characters is sound and their commitment to each other is real. This is a gripping tale which is sure to linger in your mind long after you've turned the last page. Would you like to read this book or learn more about it? Click the book cover for Come Back to Me; it will take you directly to the book's page on Amazon. If you would like to check out the reviews I've written for other titles by Melissa Foster, please check out Megan's Way and Chasing Amanda. 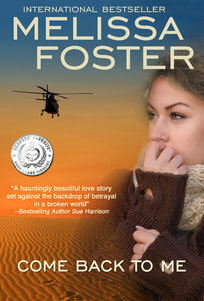 You can also read my author interview with Melissa Foster here.